Published: Jul 10, 2015 to ? "Humans." Earnestly, he loves every one of the assortment this word encapsulates. He merely loves. Even if it causes the object of his love to break. Because this informant can equally even love broken humans. The Sunset with Orihara Izaya is the first instalment of a spin-off series belonging to the very popular Durarara!! series. As the title entails it stars Orihara Izaya, the mischievous informant who is the source of so much trouble, as the main character. In this volume we get to see Izaya outside of his usual environment. Instead of the frantic, high-paced urban setting of Narita's Tokyo with all its supernatural chaos, rival gangs, yakuza wars and the vast quirky cast readers have come to associate with Ikebukuro; we are introduced to a mining town locked in a fierce tug-of-war between two factions. This change allows Izaya a lot of leeway. As stated in the postscript, Izaya's ability to function as a free agent is somewhat limited in the main series as his very name carries the reputation of danger. But in the town, by the name of Bunokurashi, Izaya is a stranger and several of its citizens struggle to come to terms with what exactly an informant is, what his goals may be, and what kind of backing he has. Such a sense of bafflement before the convoluted plots that Izaya weaves is nothing new but it reaches a different level of intensity as the battling factions try to place Izaya in their own conflict. The town, that goes by the name of Bunokurashi, is a place of darkness in its own right. Unlike the zany, often dizzying atmosphere of Durarara!! 's Tokyo, Bunokurashi is a claustrophic town locked in a long strife between the Adamura, a land owner family and the Kiyojima, connected more to the political classes. Both resort to severe means of repression including bribing, doing away with troublemesome indivuals and not even stopping at murder. It is a much more realistic scenario and the new cast is also for the most part more believable than the highly eccentric gang from Dura!!. The way Izaya plays these characters, ranging from the patriarchs to the younger generation, as well as dirty cops and foot soldiers, is brilliant as ever. As for the old cast, it is not entirely absent. A series of interviews on the topic of Orihara Izaya was intermingled with the action proper and in these the characters of Duararara!! expound on their opinions of who Izaya is. These vignettes, short as they are, offer some very interesting insight made all the more so since the characters are not clearly identified. Those familiar with the franchise will easily figure out who is speaking but the process is a fun one that fully engages the reader. If Izaya has a greater latitude of action, he is also limited in a very tangible way. 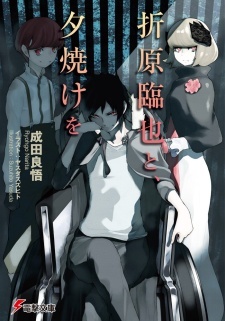 Izaya is in a wheelchair, a debilitating situation that makes for some rare- and for that reason precious- moments of self-reflection as Izaya ponders on the psychological aspect of his condition. These are often framed by Izaya's interaction with a band of allies of sorts, a group of very different people whose interests end up matching Izaya's. As it is so often the case, these new characters range from having a strong attachment to Izaya to biding their time to get rid of him. They create a new tension to the story and some provide some rather amusing banter. Overall this volume is a mixture of murder mystery, action, mind games and Izaya at his sharpest. I recommend it to diehard fans of Durarara!! as well as those who are fascinated by the disturbing allure of Orihara Izaya.